Honda-Khanna: Friends for Now | Big News in San Leandro? | Quan: Huh? What? CHAPTER 14 | The number of candidates hoping to be the next mayor of Oakland has reached 17, but the potential eighteenth entrant could have the most impact. That is, if she ever makes the eagerly-awaiting decision to jump into the race. 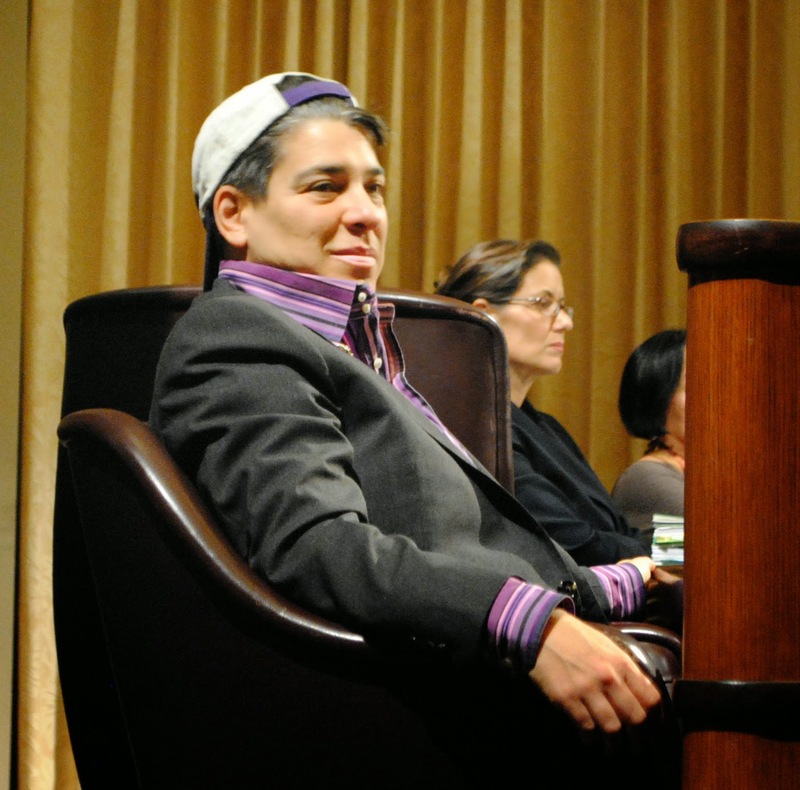 Will Councilmember Rebecca Kaplan run for mayor or will she not has been an Oakland parlor debate for months. However, there are signs a decision is imminent. Yet, there are still attempts to attract insiders off the scent. In the last week, several City Hall insiders have said Kaplan is poised to run for mayor and, in fact, in the process of ramping up for the big announcement. Some note Kaplan’s nuptials this summer will play a role in the timing. Meanwhile, members of Mayor Jean Quan’s inner-circle claim Kaplan has told them she will sit out the race this fall. to enter the Oakland mayoral race. Many in Oakland believe the addition of Kaplan to the race is a game changer. Some polls show her immediately shooting to the top of the pack that includes Councilmember Libby Schaaf, Dan Siegel, City Auditor Courtney Ruby, Bryan Parker and Joe Tuman, who ran in 2010 in the same race with Kaplan and Quan. After last Wednesday forum, Tuman said he would welcome Kaplan into the race, but expects a decision much sooner than later. Simply put, if Kaplan waits too long, she risks entering a race with somewhat of a money drought. Fundraising taps are already beginning to go dry in this race, said Tuman. The only other method for Kaplan would be through independent expenditure committees. But, while those opportunities could represent large cash flows, election law prohibits campaigns from coordinating with the committees. There is also a stain associated with the unfettered expenditure committees that could be easily exploited by her opponents. We have already seen it in the East Bay’s 16th Assembly District race with Dublin Mayor Tim Sbranti. Labor interests have poured over $1 million into the race on his behalf. The outpouring has allowed his moderate Democratic opponent Steve Glazer to question Sbranti’s independence from the unions. Ultimately, Kaplan has six months until Election Day and she can’t wait much longer before finally showing her cards. 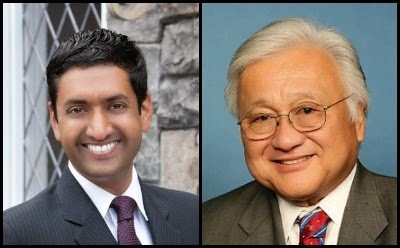 CAMPAIGN FRENEMIES There has really only been one instance when Democratic 17th Congressional District candidates Rep. Mike Honda and Ro Khanna has gone somewhat negative. It occurred a few months past when Honda’s campaign unearthed footage of Khanna lavishing praise on Honda’s work in Congress. This was a year before Khanna announced his run to unseat Honda, but since then, there appears to be a genuine push by each to run campaigns respectful of each other. But wait. At Saturday’s forum, Khanna told Honda, “You’re a good man.” When Honda had a chance to speak, he threw out an unenthusiastic “Ditto.” This week, Khanna nearly mimicked the video cited by Honda’s campaign, telling me he has great respect for Honda’s work over the years, but also believes he can give a fresher voice for the district, along with a greater knowledge of its newer portions in and around Fremont. While canvassing, Khanna said voters in Fremont still mistakenly believe Pete Stark is their representative, while some in Sunnyvale believe Rep. Anna Eshoo represents them in Congress. Also, note the contrast between the respect from the challenger for his fellow Democratic incumbent in this race to the intramural 15th Congressional District race in 2012 between Stark and Eric Swalwell where there was nothing but enmity between the two from the start. In fact, Swalwell is still reminiscing during this campaign against State Sen. Ellen Corbett about his decision to challenge Stark, a representative he still insists was never to be seen in the district. We’ll have to wait and see if Honda/Khanna morphs in Stark/Swalwell territory by Labor Day. It could happen. Stephen Cassidy: one and done? 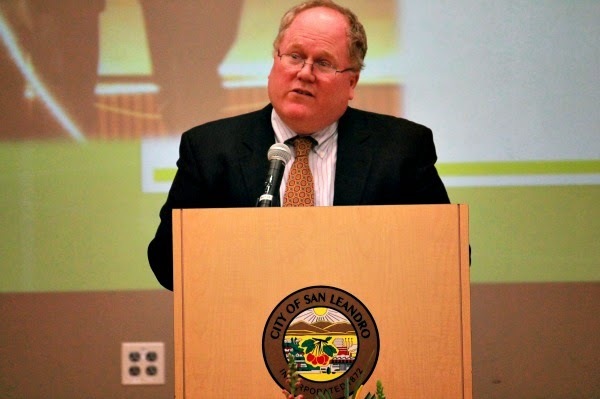 HERE AND THERE There are rumblings San Leandro Mayor Stephen Cassidy will not run for almost certain re-election this November after just one term in office and the reason may be job-related. If so, it could ignite a rush of current council members into the race similar to what occurred in Hayward with the retirement of Mayor Michael Sweeney…Bob Wieckowski’s state senate campaign team was anticipating Mary Hayashi’s use of the assemblyman’s 2012 vote highlighted in the BobProtectedRapists.com released on Friday…Both campaigns also fear Republican Peter Kuo easing into the top two. However, it’s not clear whether Kuo’s lack of name-recognition outside of Santa Clara County could make advancement to the November election possible…Ellen Corbett gave hint on Friday to what might be one of her most potent personal attributes: being a career-oriented, single mother. Folks in San Leandro often recall Corbett as its mayor in the 1990s arriving at events with her young son in tow. The contrast with Eric Swalwell, the young bachelor is, well, stark…Oakland mayoral candidates Dan Siegel and Jason “Shake” Anderson had some calm, but frigid words after last Wednesday’s forum. At issue was a supporter of Anderson’s who was telling people Siegel’s hands were bloodied from a vote during his tenure on the Oakland school board…Oakland Mayor Jean Quan sometimes makes off-the-wall statements. One theory is she can’t hear the question. In fact, one of her supporters acknowledged Quan should be wearing a hearing aid, but has thus far refrained from using one. 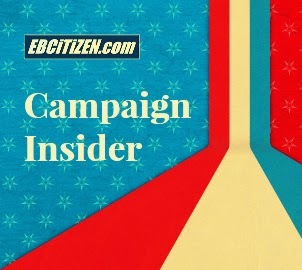 Posted in Bob Wieckowski, CA15, CA17, Campaign Insider, Dan Siegel, Ellen Corbett, Eric Swalwell, Jean Quan, Mary Hayashi, Mike Honda, Oakland, Ro Khanna, Stephen Cassidy, Steve Glazer, Tim Sbranti. Bookmark the permalink. Regarding Kaplan- All I can remember is her arm in arm with Jean Quan, leading the parade/protest that ended up turning Oakland into a frequent battlefield where it became known as the city you can trash no matter what the issue. Sorry, but Kaplan is not the kind of “progressive” leadership that will bring about a dynamic Oakland. We don't need more trash riots and endless protests with the next mayor accepting that as normal. She hardly puts forth a image that business will come to trust by investing in Oakland. Check out that photo with the backwards baseball hat. Imagine Ed Lee sitting at a meeting looking like that. Or Chuck Reed, or even Tom Bates. I remember that scene, too. I was covering the Oscar Grant protest, standing right in front of Kaplan and Quan as they stood in front of the police. Two minutes later the cops wrestled me to the ground and arrested me. They didn't nab the others. Street cred! Kaplan a game-changer? Exactly how? Certainly Kaplan, or Schaaf, or Siegel or Quan again, if elected, would mean essentially NO change from the ways things are done (or not done!) in city hall in Oakland. Lotsa early frontrunners in polls end up losers in elections. Another theory is that she is cognitively impaired. Meaning Alzheimer's or Parkinson's, etc. related problems. Another theory about Jean Quan, (and I'm very serious), is that she just isn't all that smart. She has surpassed her level of competency in her current position. As as council member she was able to hide that fact more easily. Quan being stupid is not just a theory. Kaplan is smart and able, but should work on how she carries herself. She should have a more professional image. Kaplan in her clown outfits. Quan as clown. They should get their act together. Or maybe they have. All the polls have Kaplan ahead and if you lived in Oaktown you would know why she is well respected. Two recent polls show Kaplan with small pluralities over other establishment figures like Schaaf and Quan. Don't know if this has any meaning at all since it's very early in the season and those polled don't seem interested in changing the oil in the transmission downtown. I just do not see Councilmember Kaplan entering this race. Run Kaplan run. I'll vote for you. Like Rebecca a lot and hope she runs—–there's still time.